The motivation for this post comes from the desire to point out that the catch-all term used by the media ‘everybody’ is non-existent in at least two ways. Upon hearing ‘however this way of training is not for everybody’, or ‘however not everybody is happy’, one attempts to find this entity called ‘everybody’, no such entity can be found. My point is to simply highlight the insanity of taking conventions that apply in language, and superimposing them on our actual experience. When it comes to training or moving there are two actualities or possibilities that we need to be aware of. 1. In healthy development, the program in the CNS for our gait mechanism is Universal. ie. 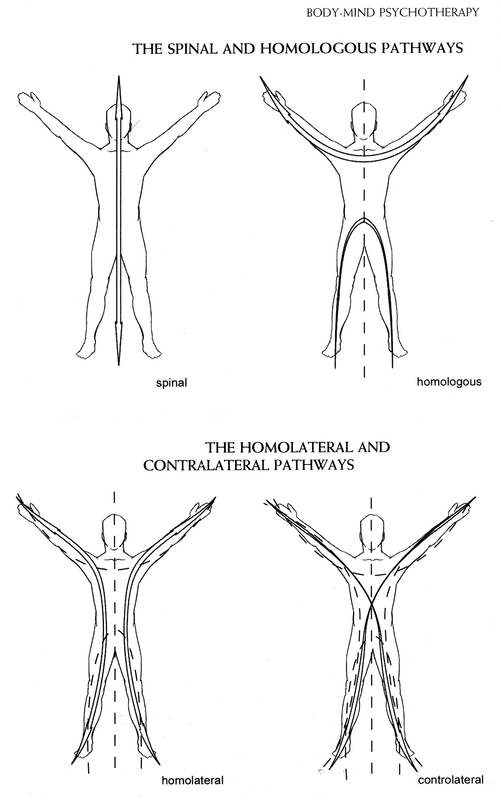 Contralateral pattern. That is ideal walking is the same for all of us, the individuated expression that is walking, will always be individuated. The compensations we bring to walking arise out of an individuated context, that is, the sum of all the happenings in our life to this point, have affected the way we walk. 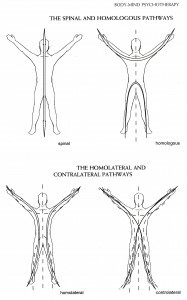 The way out of the difficulty arises out of contrasting the compensation with ‘functional ideal’, which we know by studying developmental kinesiology. Given that we are all subject to the same evolutionary ’causes and conditions’, the intelligence that is an expression of this evolutionary adaptation is Universal. My individuated interpretation of the intelligence, which turns up as the way I move, is individuated, but the capability is Universal. A natural intelligence movement program expression such as MovNat, teaches participants to ‘tune’ to this evolutionary intelligence. They also know and teach that different movement contexts will bring about different ways of perceiving possibility within the environment, these solutions are in-built within the capabilities of the brain and CNS. The training simply brings out the capability. As Alan Watts explained when he lectured all over the world on the ‘Nature of Reality’; the organism and its environment are a single behavioural process. 2. When we discuss or consider different ways of training, we do so from our preferences. These preferences are conditioned by our culture, parents, peers, and all our experiences to that point. This means that when we make a choice, it is not done so from a neutral perspective, but from this conditioned perspective. The choice also comes with judgement, and expectation which is conditioned. When the media use the term ‘everybody’, it is done so in a derogatory fashion. By this I mean, it has subtle connotations, that whatever the method is, it is not so good, that it has pleased the fictional entity ‘everybody’. 1. Pleasing a fictional entity. 2. Mis-interpreting what is Universal (the pure potential of the capabilities of the brain and CNS), with what is individuated (expression + up to date preferences). Given you a new way of seeing and understanding potential and manifest intelligence. Realising that the conventions of language are symbols, and do not represent or in any way contain our actual experience. Upon reflection of my up to date interactions and attempts at living and communicating post-conventionally, I would say that our need for and addiction to ‘labels’ is the greatest undermining force acting on our natural curiosity at this point in our unfolding. This is because the ‘label’ is the beginning of the exploration, not the final word!